Comments Off on INTRODUCING YOUR CHILDREN TO RELAXATION IN A NEW WAY— WITH A MOVIE! INTRODUCING YOUR CHILDREN TO RELAXATION IN A NEW WAY— WITH A MOVIE! As many of you know, I have been inspired by my work with hospitalized children to design mind/body healing resources to help all kids help themselves calm down, get to sleep, reduce pain and hyperactivity. I am most recognized as the founder and creator of MindWorks for Children: Guided Imagery Relaxation audio programs. Out of the Blue helps stressed, over- loaded, anxious children calm down and reduce their anxiety with natural methods so they can improve their focus, concentration, do better in school, reach their full potential and feel happy! Out of the Blue is presented to your child through a series of nature illustrations, painterly photographs, soothing voice narration and interactive materials that incorporate all of the five senses. 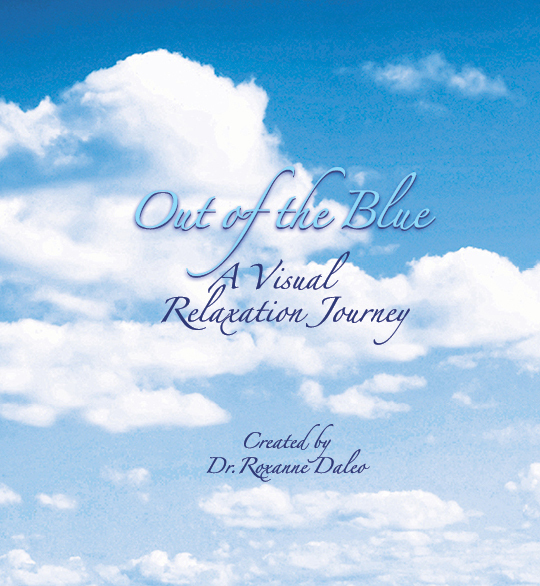 Out of the Blue takes your child through a visual relaxation journey. Using simple imagery like a cloud passing by or a leaf falling from the tree to clear negative feelings, the viewer can find peace. Out of the Blue is a new kind of movie viewing. Just by watching and breathing, you are taken out of the blue, the dull drums and then out of the blue something wonderful can be discovered. Join me as we have fun sharing the most vital aspects to health and healing- joy, love and peace. Click here and watch how easy it is! If you like the video, please comment and pass the link onto your family and friends who have children!